beautyblender blendercleanser: "Keep your makeup sponges and brushes in prime condition with this soy-based formula, which removes built-up bacteria and oil." I'm a devout fan of MAC's brush cleanser, but I'm willing to give this little guy a shot! Algenist Regenerative Anti-Aging Moisturizer: "Looking your age is so overrated. This sophisticated moisturizer uses an exclusive microalgae compound to delay the cellular aging process." Arquiste Flor y Canto: "A fresh blend of sweet blossoms, this white floral scent takes inspiration from an Aztec festival circa 1400." This smells absolutely delicious; it's a fresh clean scent I'd definitely wear, although it's $165 price tag is a bit steep for me. stila sparkle waterproof liquid eyeliner: "Pearly shimmer meets intense pigment in this lasting liner. Better yet, the pen-like wand makes wiggle-free application a breeze." This is hands down the best. Besides, it's a full-sized product retailing for $22, so it alone makes the box more than worth it! I got 'Starry', which is a charcoal shimmer color. It seriously DOES NOT BUDGE and stays put all day long. I plan on buying every color of this eyeliner; it's perfect for the pool! Birchbox Extra ~ Notecards: "Text messages are no match for handwritten notes on fun, modern stationery." This is adorable, and my mom loves to send notes in the mail. I'll definitely be sending this to her! All in all, this was a decent box, if for nothing else but the stila eyeliner! 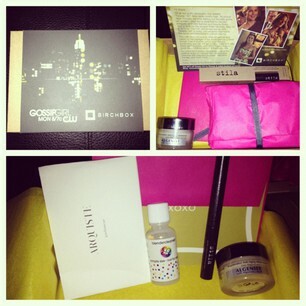 If you're not a Birchbox member yet, sign up now and for only $10 a month, you get a fun present to look forward to! What was in your box? Your box definitely looks better than some of the ones I have seen. https://www.facebook.com/media/set/?set=a.301454306600265.72431.182355108510186&type=3 and watch what we do? you're a very nice blog ! so, we wish your opinion! If you become our follower, we will become your followers too!